Anyone working in a warehouse or a factory will tell you for a fact that danger always lurks around them. It gets worse when they have to clean their places of work because cleaning often means slippery floors and use of harsh chemicals. That explains why industrial cleaning must at all times be conducted by professional industrial cleaners. But what does it really take to handle industrial cleaning chemicals in the first place? Read on to find out! A comprehensive list of all cleaning solutions used in the facility should always be kept by the cleaners. This kind of documentation should be exhaustive and include crucial details such as the number of gallons stored, where they are stored, potential hazards and all the required precautions for each cleaning solution such as how the chemical should be stored. That is, should the chemical be refrigerated or kept away from direct sunlight? All cleaning chemicals should be stored in their original containers. Avoid mixing containers even if they are supposed to store the same type of chemical. There are several reasons behind this safety precaution. 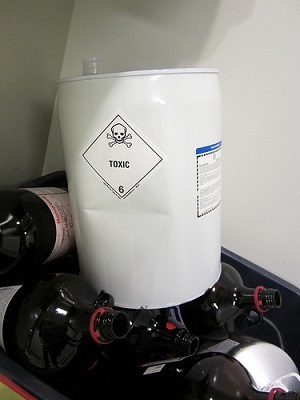 First off, storing your cleaning chemicals in different containers will prevent chemical reactions which can be dangerous if the cleaning solutions are highly reactive. Then there is the fact that some cleaning solutions have short lifespan. Mixing a ‘fresh’ chemical and ‘old’ one can easily compromise the effectiveness of the cleaning chemical in questions. Most, if not all cleaning products should always be kept in well ventilated areas. Make sure the solutions are stored away from direct sunlight as already hinted. They should always be stored away from HVAC intake vents. That way, you can easily prevent toxic fumes from spreading to other areas in the facility. Accidents are common as far as industrial cleaning is concerned. With that in mind, always have first aid tips on your finger tips should anything unfortunate happen as you clean. Note that accidents in this case are not limited to consumption of toxic industrial cleaning chemicals. Inhaling fumes emitted by some of these chemicals can easily make one pass out. That is where one’s knowledge of first aid comes in handy. Ensure your employees know what it takes to perform first aid should their colleague inhale or accidentally inhale a highly toxic cleaning product. Never underestimate the importance of proper signage when cleaning is underway in a warehouse or a factory. A simply safety signage can go a long way to prevent accidents and loss of lives. That said, install safety signage in multiple languages. The signage should have both images and words so as to quickly convey safety messages. Note that there is a universally accepted use of signage. Find out more about the most important signage, where and how to place them. Then make sure that the signage you intend to use adheres to the Globally Harmonized System of Safety Signage. Do not at any point dispose industrial cleaning chemicals and solutions as people often do with home cleaning solutions. Negligent disposal can lead to environmental pollution as you probably know. That’s not however, the real danger that often comes along with negligent disposal of industrial cleaning chemicals. Some chemicals are not only toxic but radioactive. Disposing them without proper care can therefore endanger both human and animal life. Make sure your industrial cleaning service provider disposes off any cleaning chemicals they use in a safe and eco friendly way. This is pretty much obvious. Unfortunately, not everyone observes this simple rule. Always protect your body from harsh cleaning products. Ensure your eyes and hands are well protected. Ensure too that you do not inhale fumes emitted by toxic cleaning products by protecting your eyes. Again, this is a simple rule often overlooked by professional industrial cleaners. Do not assume you know or you are experienced enough to use some products without referring to the instruction manual. Read the manual then use the cleaning products as required. Ask for clarification from more experienced personnel, should anything on the instruction manual confuse you. This is extremely important. Everyone working for you should be able to understand and know by their finger tips what the basics of industrial cleaning. They should know first aid tips as already explained. They should also understand what the words caution, warning and danger mean anytime they appear on a signage. Lastly, make sure that all employers are familiar with the cleaning schedules of your industrial cleaning service provider. That way, they can always give the cleaners ample time to clean without interfering. All machines should be switched off during cleaning. There should also be adequate light and proper ventilation before, during, and after cleaning.